Watch the animals come to visit the busy waterhole. 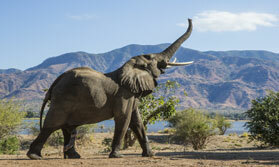 Soak up the vistas from the plateau above the Zambezi National Park. Enjoy out-of-town experience just 4km from the Falls. Complimentary hourly shuttle to town. Take a dip in the refreshing two-tiered pool. Victoria Falls Safari Lodge boats an enviable location on a high plateau right on the boundary of Zambezi National Park. It's only 4km from the town of Victoria Falls themselves, but you will feel a million miles away as you sit on the deck overlooking the busy waterhole below the lodge. They style of the building is that of a wood and thatch safari lodge, though this one is on a larger scale with 72 rooms and multiple areas where guests can relax and unwind. Service and facilities here are of a high standard and the decor has a vibrant African theme. The MaKuwa-Kuwa Restaurant has no walls or windows and offers meals with a view. Breakfast, lunch and dinner are served here, a tasty menu of international dishes with a distinct African twist. On a lower level you will find the Buffalo Bar, the deck here overlooks the waterhole, a great spot for a sundowner. The swimming pool also has its own deck also overlooking the waterhole, here you can enjoy a refreshing dip in the two-tiered pool which is built into natural rocks, while enjoying the views. The rooms and suites range from standard to deluxe to suites. There are a number of interconnecting rooms which are great for families. All rooms enjoy a private balcony, air conditioning, fan, mosquito net over the bed, a safe, mini bar, tea/coffee station, hairdryer, IDD phone, and the en-suite bathroom has a rainfall shower. The bathrooms in the suites also boast a bathtub. It's a wonderful place to stay giving you a safari experience and feel while only being a few kilometres from the town, there's an hourly complimentary shuttle between the lodge and town too, so you have the best of both worlds. There is a well-stocked curio shop and an activities desk so it's easy to arrange any additional activities that might take your fancy. There is plenty to do in Victoria Falls from a flight over the Falls, to a river cruise, bungee jump, white water rafting to simply enjoying the wonderful sight that is Victoria Falls - The Smoke That Thunders! Open: Victoria Falls Safari Lodge is open all year. Location: You are just 4km from Victoria Falls on the edge of the Zambezi National Park. Rooms: There are 72 rooms in total ranging across standard, deluxe and suties. All are en-suite and have full air conditioning, mozzie nets, fan, telephone and safe. Views can be enjoyed from the private balcony. Activities: There is a huge choice of activities available in Victoria Falls and a complimentary hourly shuttle take you between the lodge and town. Walking in the rainforest, take a cruise on the Zambezi River, go for an elephant back safari or indulge in some adrenalin-charged activities such as a helicopter or microlight flight over the Falls, white water rafting and bungee jumping off the Vic Falls bridge. All these activities can be arranged and paid for at the dedicated activity desk in the hotel. Facilities: There is a restaurants and bar serving delicious international cuisine with an African slant. There is a small library and a choice of seating areas around the hotel. A well-stocked curio shop provides a solution to souvenirs. The outdoor swimming pool is built into natural rock and overlooks the busy waterhole. Dining: Meals are served at individual tables from an a la carte menu. Children: Children of all ages are welcome. There are 5 sets of interconnecting rooms for families. Communication: There is Wi-Fi internet access throughout the hotel and IDD phones in the rooms.